Need a way to help avoid costly process delays and shutdowns? CAS DataLoggers has the solution! Our new Compressor Monitoring kit is a single solution which logs temperature, runtime, current consumption and voltage. The new kit also contains probes for measurement, a datalogger to take and store the readings, and built-in software to analyze the data. Our kit is a cost-effective way to monitor single-phase compressor motors for both current and voltage, helping users to maintain them and to get an indication of when they are in danger of failing. By helping to prevent a process shutdown, the kit can pay for itself in a single event! Energy surveys take much less time when all the data is taken and extracted from a single system. This way users can quickly find out if a compressor is the correct size. Installers can use this portable but powerful kit to measure compressor On and Off time and the current consumption of a wide range of compressor models. Our system is easy for field personnel to operate with equally simple software. Condition Monitoring of recent current and voltage fluctuations helps ID failing single-phase compressor motors. For example, the motors’ effectiveness could be strained by low-voltage conditions. The included multichannel logger allows users to view the load on the compressors and see which are in danger of failing. It’s easy to connect the DT80 to external voltage and current transducers and then hook them up to a single-phase compressor motors, a pair of motors at a time. The datalogger’s channels will then monitor their current/voltage levels according to your preferred logging schedule. The DT80 can also auto-alert workers to sudden current and voltage fluctuations in the motors. The kit includes a dataTaker DT80 Intelligent Data Logger to monitor both compressor runtime and current consumption. To do this, users place a current clamp around the compressor supply, then check the logger’s display while the compressor is operating in its loaded and idle states. The dataTaker will then auto-record the current levels and On time to Off time. The DT80 can also log ambient temperature, which is useful in viewing compressor effectiveness. The DT80’s universal inputs enable connection to most sensors so that current/voltage, temperature, 4-20mA loops, and more can be logged and scaled. Additionally the dataTaker’s durability provides years of reliable operation, and the logger’s large memory stores up to 10 million data points. The kit’s datalogger features several communications options including RS232 with modem support, Ethernet, and USB memory stick ports. FTP can provide data directly to your office over the internet or mobile phone network. Built-in support for Modbus RTU communications gives the DT80 even more flexibility when monitoring compressors. Built-in dataTaker dEX software is included with the dataTaker datalogger for professional analysis. This software uses a Windows Explorer-style graphical interface allowing quick setup and configuration of the dataTaker. Users configure and run the software directly from a web browser to access the DT80 locally or remotely online. It’s easy to view all measurements in real time and display them as mimics. 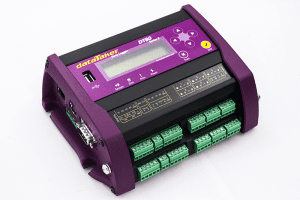 Operators can use any of the dataTaker’s integral communications ports to view dEX, including USB, Ethernet and RS-232. For more info on the new Compressor Monitoring kit featuring the dataTaker DT80, or to find the ideal solution for your application-specific needs, contact a CAS DataLoggers Application Specialist at (800) 956-4437 or visit our website at www.DataLoggerInc.com.